It’s great to own 4K TV, no matter Smart TV or HDTV. You may find, with the development of the industry, the display of TV is getting better and better. 4K UHD is a resolution of 3840 pixels × 2160 pixels and is one of the two resolutions of ultra high definition television, the other being 8K UHD which is 7680 pixels × 4320 pixels. Both are aimed at consumer televisions. 4K UHD has twice the horizontal and vertical resolution of the 1080p HDTV format, with four times as many pixels overall. So users who always watch movies on 4K TV (Samsung, Sony, LG, Toshiba, ViZio, Panasonic etc.) must be pleasant. You can watch movies on 4K TV via internet, or Netflix. Do you know how to play movies on 4K TV via another way? USB Flash Drive, yes. This is a good way to. But, if you want to play all kinds of video files on 4K TV, you have to use an external tool. Because 4K TV doesn’t support all the types can play successfully. Such as MKV, AVI, MTS, MP4, Tivo, MOV, WMV, MTS, M2TS, VOB etc. Here, this article will give all users a good solution to easily solve 4K TV audio and video incompatibility issues. You can use 4K TV Video Converter, which is a real All Formats and DVD/Blu-ray to 4K TV Converter. It could convert any video files for 4K TV, like Samsung UHD 4K Smart TV (UHD 4K HU8550/9000/8500 Series, UHD 4K S9V Series, UHD 4K LED 9000 Series, UHD 4K S9 Series ) Sony XBR-84X900 4K Ultra HD TV, LG 84LM9600 4K TV, Panasonic 4K OLED TV (TC-65AX800U, TC-58AX800U), Toshiba 4K Ultra HD 84-inch 84L9300, and more. Are you really needs 4K resolution? Although there are some different between 1080P and 4K, as far as resolution you can’t find the obvious different with your eyes. Because when we watching TV, usually we keep a certain distance with TV, we can get a better visual experience. The distance will cover the different. Do you have 4K video resource? I think you haven’t. Only some camera video up to 4K, common movie resolution is 720P or 1080P. Converting 720P and 1080P video to 4K is a meaningless thing. So, we suggest you convert video to original resolution. Now, just follow me to have a look at how to convert MKV, AVI, M4V, MTS, Tivo, MOV, WMV, MTS, M2TS, VOB to 4K TV. Step 2: Click on the “Add File” icon to import your video files, you are allowed to import multiple files at one time. You can click “Load Disc” to import DVD/Blu-ray files into 4K TV Converter. 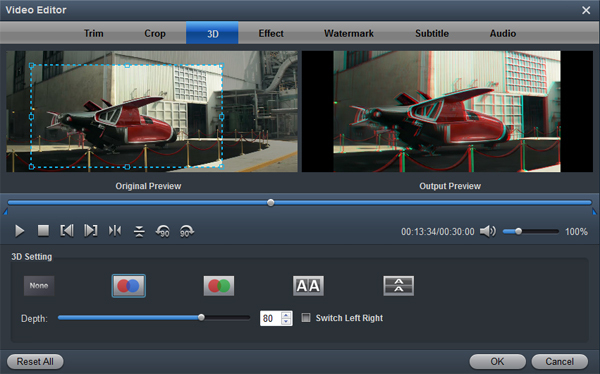 Step 3: If you like, you can click the “Edit” button to do some simple editing. Such as trim, crop, split, add watermark, etc. If you want to get 3D video for your 4K TV, this 4K Video Converter can hellp you add 3D effect onto any 2D videos. Meanwhile, if you want to only output one file, just hitting “Settings” button then check the option “Merge all videos into one file” on the main interface to combine several videos into one. Step 4: Choose output format for your 4K TV. Click “Output Format” bar, there is a “Common Video” category, which contains many presets for 4K TV. Choose H.264 MP4. It’s the best video format for converting any video for 4K TV. After choose the output format. You can click “Settings” to adjust the video quality in order to fit your own display. You are allowed to adjust bitrate, frame rate, resolution, video encoder, audio encoder, channel and more. Here, you can select “1920*1080” as output video resolution. Step 5: When everything is what you want, click the “Convert” button to start the video conversion for 4K TV. After conversion, you can click “Open Folder” to local converted video files. You can transfer the video to USB Flash Drive or a digital device. You can play movies on 4K TV via USB freely. 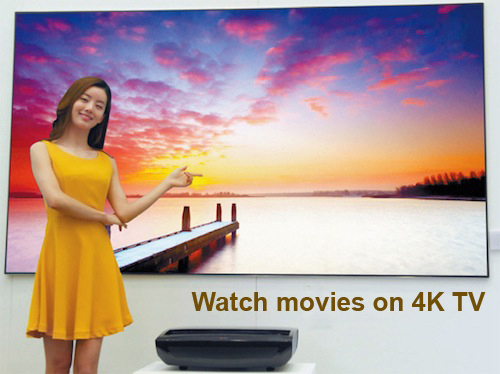 By now, you have learned the full info about transcoding videos for 4K TV, just try it by yourself. In addition, if you are a camcorder user, you may be also interested in the other great function of this program. As far as i know, it supports special codec as output for editing software. Like Apple ProRes family for Final Cut Pro series, AIC for iMovie/FCE, DNxHD for Avid Studio, H.264 for Premiere Pro and more. Which can easily help you to easy and fast import Canon, Sony, Panasonic, JVC, Nikon footage into FCP, FCE, iMovie, Premiere Pro… for editing. How to play 3D movies on Toshiba TV, LED/LCD TV? Try your software is an unforgettable experience. I didn’t think there would be such a good result. I can convert and edit my footage recorded by Samsung NX500. I can’t use words to describe my gratitude.